Python's syntax is simple and easy to understand, and when they said its designed to produce readable code, they weren't kidding. This made teaching programming for me a piece of cake. Of course, the hardest part of teaching such a subject to our future 3D artists who are excited to produce animation, models and render can be tricky. That leads me to something in regards to this... Other than programming, one of the things that I most enjoy about working with CG is that it is indeed all about being able to problem solve to find work-arounds, or ways to "cheat" to produce a shot or effect (or solution to a tool limitation, a rig problem, and the list goes on and on). So the logical process that goes into problem solving is not just a skill for programming. 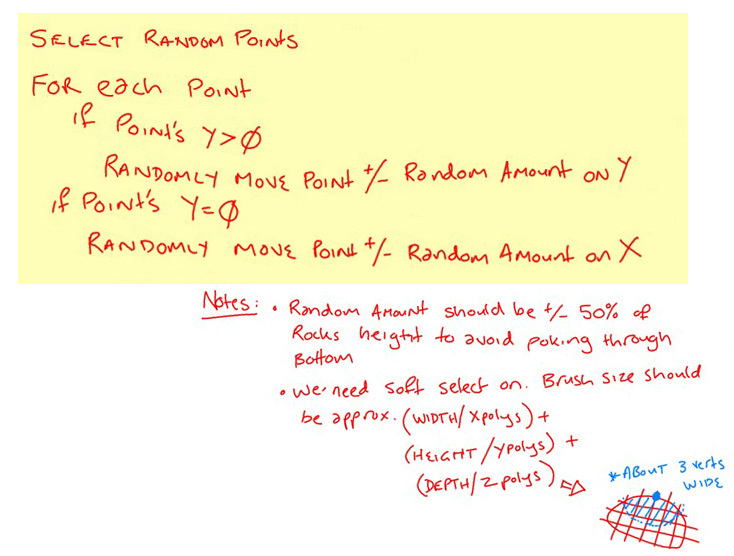 The sketch approach works by drawing up the solution as a bunch of "if we move this, then this..." notes. The exercise I went through over two days was based on a suggestion from one of my students who was developing a game along with others in class. 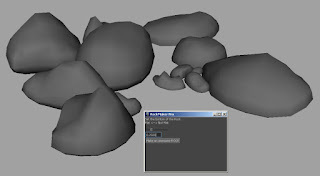 How could we produce a simple rock generator to make assets for their game engine? 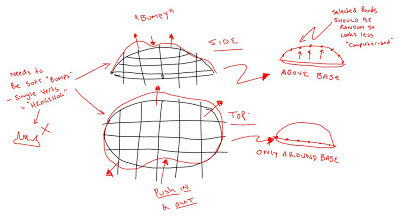 Admittedly, when I started out on this exercise, I went for the "heres how we code this" approach - but that was starting to throw some of the students off, and we ended the first day by producing a "pebble" maker instead - a spherical shaped mass where we flattened the base of the model. Some students were lost - so my plan for delivery in the next class had to change. On the second day, I wanted to take that simple starting model and look at how we can push and pull the vertices about to turn our "pebble" into a shaped rock. 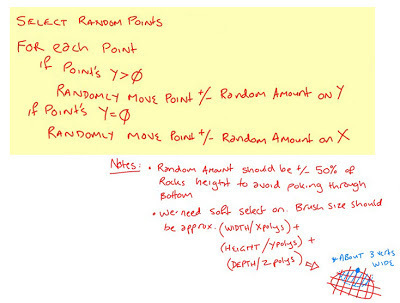 This time around, I approached it more visually and stepped away from the computer and across to a whiteboard. Using a quick image, we looked at what would make a rock look like a rock. The general idea was to raise and lower random vertices on the top of the model to produce a lumpy shape. To make sure it looked less like a lumpy sphere, we would also need to push and pull it horizontally to deform it as seen from the top. A little pseudo-code to explain the process in words helped (and hand-writing it on a whiteboard, rather then typing it up on screen I found makes it much more accessible) and then time to discover the appropriate Maya functions and methods required to do this were put into practise. The result - hopefully a relatively nice simple rock generator! Instead, a better idea was to use Maya's soft select and then move vertices to get a softer area of deformation. Vertices above the ground would be moved up and down. 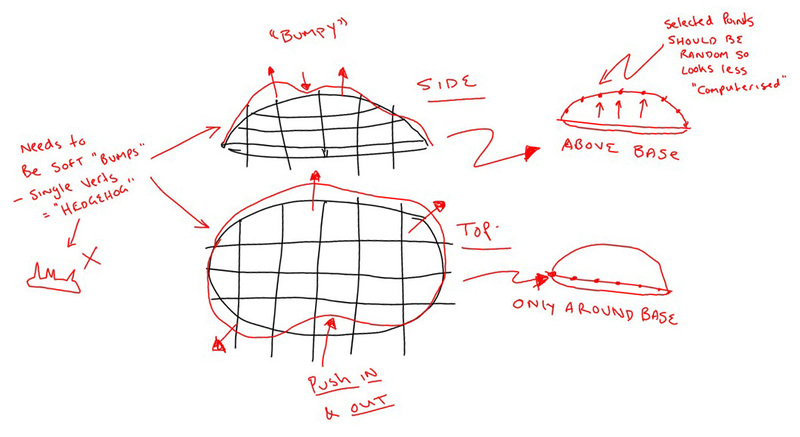 Using vertices that ran around the bottom edge (at Y = 0) would be moved horizontally to deform the shape from above. I hope it helps those new to programming in python for Maya by showing how such a tool can be created quickly and easily. In fact, the hardest part was simply finding the right Maya functions and methods to call.